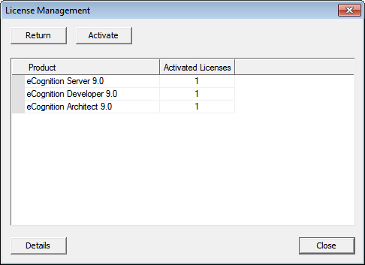 This section describes the steps for installing License Server Software. After downloading and extracting the .zip file containing the License Server setup.exe installation file, start the installation by double-clicking the file. This launches the setup wizard where you have to press Next to proceed. Select I accept the terms in the License Agreement to proceed to the next screen. In the Activation Options dialog, enter your Entitlement ID which you obtained in your Entitlement-email. In the next dialog please select the licenses you want to activate and click on Activate. where to download this file? I have also activated 10 seats for eCognition 9, but when I tell Developer the IP address of my license server, it goes into a loop asking for the IP address of the license server. eCognition does not run. @He Yinan: eCogLM.exe is a part of the license server installation and can be found in the installation directory.